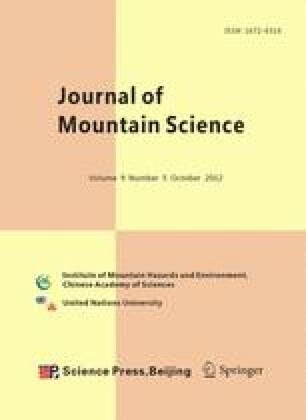 The objective of this study was to understand the effects of forest gap and variations in different seasons, gap size, locations and diurnal variations on forest microclimate and soil water content. Spatial and temporal distribution features of air temperature (T A ), soil temperature (T S ), relative humidity (h) and soil water content (Ψ) were measured in Castanopsis kawakamii natural forest gaps created by a severe typhoon or fallen dead trees. The results showed that: (1) the variations of T A , h, and T S in four seasons were extremely significant. The variations of Ψ in four seasons were extremely significant except for those between spring and summer. (2) The diurnal variations of T A and T S were expressed with a single peak curve. The diurnal variations of h and Ψ presented a high-low-high trend. (3) The variations of T A , h, and T S were extremely significant among the large, medium and small gaps in C. kawakamii natural forest. Medium gaps had the highest T A and the lowest h while small gaps were just contrary to medium gaps. The variations of Ψ were extremely significant for large, medium and small gaps except those between the medium and large gaps. (4) The T A , h, T S and Ψ were decreased from the gap center, canopy gap, expanded gap to understory. These results will help further our understanding of the abiotic and consequent biotic responses to gaps in the mid-subtropical broadleaved forests, which also provide a theoretical basis for the scientific management and population restoration of C. kawakamii natural forest.